“From then on, when anything went wrong with a computer, we said it had bugs in it.” Grace Hopper, quoted in Time magazine April 16, 1984. Grace Hopper was born as Grace Brewster Murray on December 9, 1906, in New York. She was the oldest daughter of Walter Fletcher Murray, a local insurance broker, and Mary Campbell Van Horne Murray. Her parents strongly believed that Grace and her three years younger sister should have the same education and opportunities as their five years younger brother and from an early age her father encouraged her not to follow the traditional role and paths of women. Grace took his advice to heart and has followed it ever since. Her mother, a housewife, not only taught her needlepoint and playing the piano but also instilled in her a love for and understanding of mathematics. As a youngster she was fascinated by all things mechanical and it is a well-known story how she at age seven took an alarm clock apart in order to see how it worked. When she could not get the clock back together again she took another clock apart to learn how it was assembled. After taking seven clocks apart her mother found out and restricted her to just one clock. The young Grace received her basic education at Graham School and Schoonmakers School – both are private schools for girls in New York City. Having failed a Latin exam she could not enter Vassar College as she had wanted, but was told to wait one year. She spent one year at Hartridge School in Plainfield, New Jersey, and in 1924 started at Vassar College studying mathematics and physics. In 1928 she graduated Phi Beta Kappa with a B.A. in mathematics and physics. She then went to Yale University where she was awarded an M.A. in mathematics and physics in 1930. That same year she married Vincent Foster Hopper, an English teacher and honors graduate from Princeton University. Although they separated in 1940 and got divorced in 1945, she always kept her ex-husband’s name, possibly because shortly after their divorce Vincent Hopper was killed in World War II. The Hoppers had no children. In 1931 she joined Vassar College to begin teaching mathematics. She continued this until 1943 when she joined the United States war effort. In 1934 she received her Ph.D. in mathematics from Yale University on her thesis New Types of Irreducibility Criteria. When Pearl Harbor was attacked in December 1941, Grace was keen to join the U.S. Navy. But her age – she was 35 at the time – and her weight – she was only 105 pounds (47.6 kg) which was five pounds too light for her height of 5’6” – made the Navy rule against her. Being a professor of mathematics it was thought she would be of more value in civil life. Grace was not one to give up easily and continued her efforts to join the Navy. She finally succeeded and having been granted leave by Vassar College, she joined the Navy WAVES (Women Accepted for Voluntary Emergency Service) in December 1943. After her initial training, she was commissioned a Lieutenant (Junior Grade) and assigned to the Bureau of Ordnance’s Computation Project at Harvard University where she worked with Howard H. Aiken on the world’s first large-scale computer, the Harvard Mark I. She was enthralled by the 51 foot long, 8 foot high machine filled with relays, switches, rotating wheels and vacuum tubes, more than 750,000 different parts in total. The Mark I did calculations with a speed of three additions per second. Hopper became the first female programmer ever. Towards the end of the war she was working on the Mark II computer. It was here where the famous “computer bug” was found (see below). Although Hopper ended her active duty with the Navy in 1946, she remained a reservist. She resigned from Vassar to remain at Harvard where she became Research Fellow in Engineering Sciences and Applied Physics in the Computation Laboratory. She continued her work on the Mark II and later the Mark III. In 1946 Hopper joined the Eckert-Mauchley Computer Corporation – later to become Sperry Rand – where she was involved with the development of the UNIVAC (UNIversal Automatic Computer), the world’s first commercial electronic computer. Although she stayed with Sperry Rand until 1967, Hopper continued to switch her interests and activities between the Navy, the academic world and civil society, often holding more than one position at the time. In those early days of computing programmers had to write their programs in binary code – strings of 0’s and 1’s – as that was the only language understood by the computer. Hopper soon realized that it would help greatly if the computer had a routine to convert instructions into machine code. In 1952 she developed the world’s first compiler, the A-0, for that purpose. This was followed by the A-1 and A-2 in 1953. Although Hopper’s compilers were initially devised to place certain subroutines (e.g. for calculating sines, cosines or doing floating-point arithmetic) in a place in the computer’s memory, it opened up the way for compilers converting high-level language into machine language. It was a significant step forward in the development of the computer. In 1956 Hopper devised the FLOW-MATIC compiler for the UNIVAC computer which translated an English-like high-level language, with words like Write and Input, to machine language. She once told the story that she had developed a French version of FLOW-MATIC where all the English words were replaced by French words. 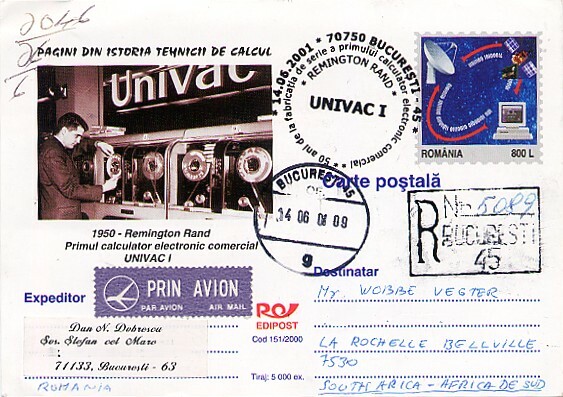 When she showed it to her bosses at UNIVAC, they were abhorred at the idea of a French-speaking computer and threw her out of the office. In the late fifties the demand for high-level programming languages became stronger. Especially the U.S. Department of Defense insisted on a common business oriented programming language. IBM had developed the COMTRAN (COMmercial TRANslator) compiler for this purpose, and Honeywell had developed a similar language, FACT. Hopper who brought in her FLOW-MATIC experience, realized that if one used full-length English words like READ or MULTIPLY in a structured and well-defined language, a compiler could be developed to translate these words in machine language. It signified the birth of COBOL – COmmon Business Oriented Language. It became the most-widely used high-level programming language of the 20th century and whole generations of programmers (including this author) were raised on it. In 1966 Hopper retired from the Navy reservist force, but the next year already she was recalled to serve again in active duty. Although it started as a six-month assignment it turned out to be for many years. She served as the Director of the Navy Programming Languages Group in the U.S. Navy’s Office of Information Systems. 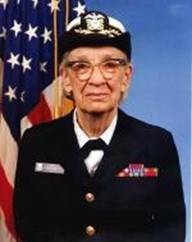 As such she was involved with the standardization of high-level languages like COBOL and FORTRAN and she instituted the testing for conformance to these standards within the Navy. Later this would be taken over by the National Bureau of Standards, which today goes by the name National Institute of Standards and Technology. In 1971, at age 65, she retired again, but the next year she was asked to re-enlist once more, the Navy seemed to find her irreplaceable. During her years with the Navy she travelled countrywide and lectured on her favorite subject “computers”, whereby she often included her own personal war-stories from the early years of computing. She was well-known for showing a piece of copper wire of about one foot long, which she called a nanosecond as that was the distance electronic information (i.e. electricity) could travel in one billionth of a second. She also showed a thousand feet coil of wire representing a microsecond. It comes as no surprise that her audiences often gave her a standing ovation after her presentations. She advocated change and often stated her motto: "the most damaging phrase in the language is “We've always done it this way”." In 1983 Hopper was promoted by special Presidential Appointment to the rank of Commodore. In 1985 this rank was renamed to Rear Admiral – she became the first woman to ever hold this rank. Due to her wealth of experience and her seniority in rank she got the nickname “Amazing Grace”. In 1986, when she was 80 years of age, she retired for the final time from the Navy. She was presented with the Defense Distinguished Service Medal, the Department of Defense’s highest award. Still not interested in leading a quiet life, she was appointed as senior consultant with DEC (Digital Equipment Corporation) to become their representative at industry forums and to serve in a corporate liaison function. She held this position until 1990. In 1991 she was awarded the prestigious National Medal of Technology by President George Bush for being “ a computer pioneer, who spent a half century helping keep America on the leading edge of high technology.” She was the first woman to receive this award. 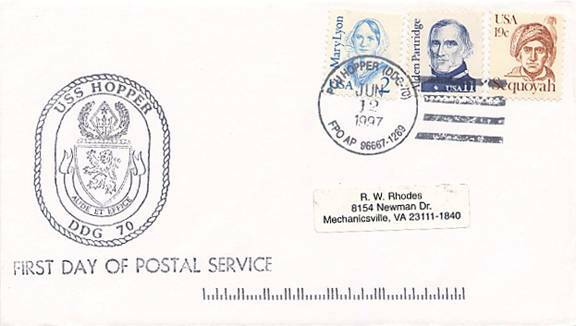 “Amazing Grace” Hopper died in her sleep on January 1, 1992 in Alexandria, Virginia. She was laid to rest with full Naval honors in Arlington National Cemetery. Grace Hopper has received numerous awards in her lifetime, of which only a few can be listed here. 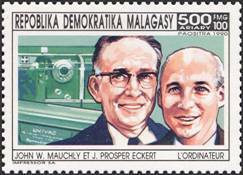 1962: Elected a Fellow of the Institute of Electrical and Electronics Engineers. 1969: Named the first computer science “Man of the Year” by the Data Processing Management Association. 1980: Awarded the Navy Meritorious Service Medal. 1985: The Naval Computer and Telecommunications Station in Dan Diego started building the Grace Murray Hopper Service Center (for its data processing department). Today it also houses a small museum with artifacts, awards and other items Hopper received during her career. 1985: The Brewster Academy in Wolfeboro, New Hampshire, where a young Grace spent her summer holidays in the Murray’s family cottage, named its computer lab after her: the Grace Murray Hopper Center for Computer Learning. 1987: Awarded the Computer History Museum’s Fellow Award. 1990: Microsoft’s female employees established a women employee group called "Hoppers"; they also established a scholarship in her honor. Grace Hopper received nearly 50 honorary degrees from universities worldwide during her lifetime. In 1997 the U.S. Navy commissioned the guided missile destroyer USS Hopper (DDG70). The ship was named after Rear Admiral Grace Murray Hopper whose pioneering spirit had served the Navy over so many years and who had led the Navy into the computer era. The USS Hopper carries an impressive array of armaments, including Tomahawk missiles, six torpedo tubes and a few other surprises. It is appropriately nicknamed “Amazing Grace” and has Pearl Harbor as its homeport. Although Hopper is often credited with having found the first bug, she was always careful to mention when she recalled the story that she was not present when the bug was actually found. When she was involved with testing the Mark II Aiken Relay Calculator at Harvard in 1947 – not 1945 as mentioned in many accounts of this story – the machine malfunctioned. 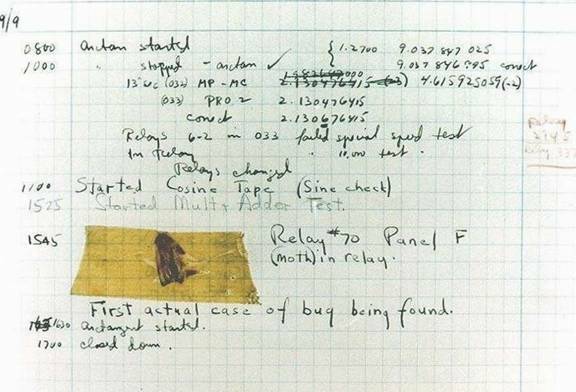 Upon investigation the operators found a moth stuck at Relay #70, panel F. Using tweezers, the moth was removed and taped to the computer log with the explanatory text “First actual case of bug being found.” The story was put out that the computer had been debugged and the term “debugging” had been added to the computer world’s vocabulary. Hopper often said “From then on, when anything went wrong with a computer, we said it had bugs in it." The original logbook page, dated September 9 and with the moth still taped to it, is located in the Naval History Center at the U.S. Naval Surface Warfare Center in Dahlgren, Virginia. In trying to identify this famous moth, I contacted a local entomologist from the University of Stellenbosch in South Africa. 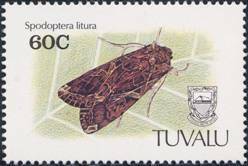 Most likely the creature was a Spodoptera litura specimen. This nocturnal moth goes by the common name Tropical Armyworm which seems most appropriate for this story.